Who doesn’t love a trip away for a long weekend! Especially over the Summer holidays! Well next week I’m off to some gorgeous lodges in a forest for 4 days and I can’t wait. If you are going away anytime soon, and if you love being organised like me, I bet you’re already thinking about what to pack and what cute outfits you want to wear whilst you’re there. Which means I’ve already started writing my packing list for it. I love writing lists about what I should pack and what I need to bring with me; I practically live my life by writing lists for everything. One list first thing in my bullet journal about what I need to do for the day, another list when I get to work for what I need to get done whilst I’m there, and then another list for what I need to get done by the weekend and then lists for when I’m off away anywhere. Since weekends away in England have unpredictable weather, it can be difficult to know what to wear, so that’s why I’m going to make a list of all the essentials I’ll be taking with me! Here’s the outfits I’ll be taking inspiration from! The dungarees, both dresses, stone biker jacket, grey shirt and the scarf are all from New Look! The shoes, accessories, black jumper, waterfall coat, striped long sleeve top, white t-shirt, collared jumper and the two pairs of jeans are all from Primark! Here’s the basic list of items I usually bring with me whenever I’m off for a weekend away, or any holiday! You can download it here and use it to help you remember everything you need! What do you like packing for when you go away? What’s that one thing you can’t leave without? For me, it’s my medication for a start, and then my hair straighteners! One thing I love about planning what I’m bringing away with me is all of the cute outfits I’ll be able to come up with! Also, by planning what I’m packing, I’ll be able to actually be a bit more decisive about what I’m bringing with me. So that’s what I’m going to be bringing with me on my little mini break! 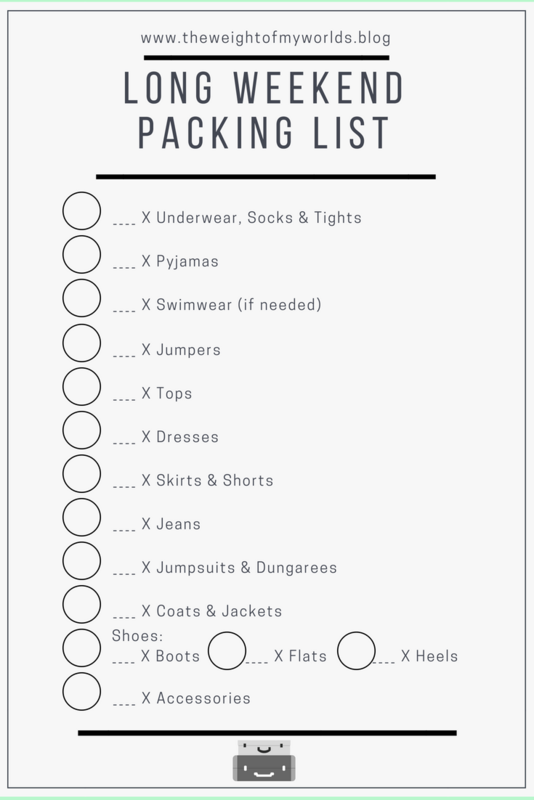 Hope this helps any of you who love to over-pack like me! And let me know if you buy any of these pieces from Primark and New Look; if you see anything whilst you’re out and about that is super cute for English weekends away, feel free to send a link or two my way!! Great post. I always struggle packing for staycations because of the unpredictable British weather!